Autumn arrived in our garden in the centre of England in October, after a gloriously warm and bright summer. 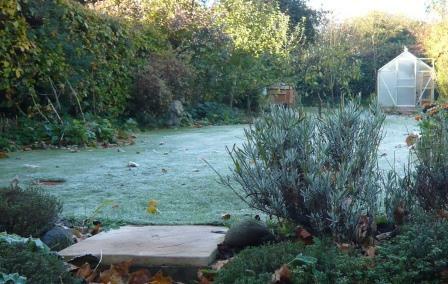 For a few days we woke to frost. It lingered on the lawn and the fallen leaves until the morning sun melted it. Our range has now increased to thirty-nine tools, as well as watering cans, garden gear and books. 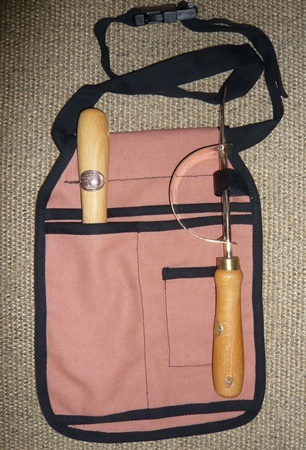 Our tool pouch now comes in organic terracotta cotton canvas. 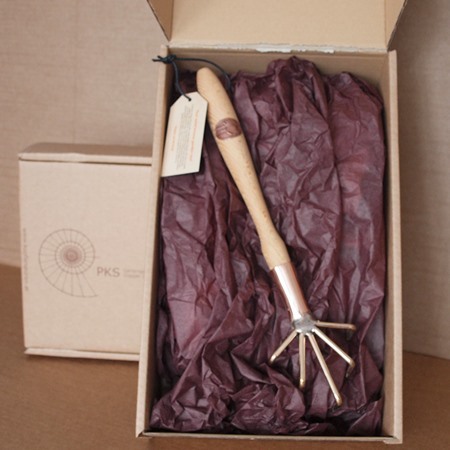 Here it is, with the Tabit Weeder and Vega Hand Fork. With its adjustable strap, it fits comfortably at your waist and the tools are not lost somewhere in the garden. We have also added some packaging options. We wanted to show the tools at their best when they are given as a gift, so we now offer a choice of coloured papers to go in the gift boxes. Here is the Lyra 5-Claw in a large gift box with chocolate-coloured tissue paper. We offer two other colours of tissue paper: rich claret and bright, vibrant violet. 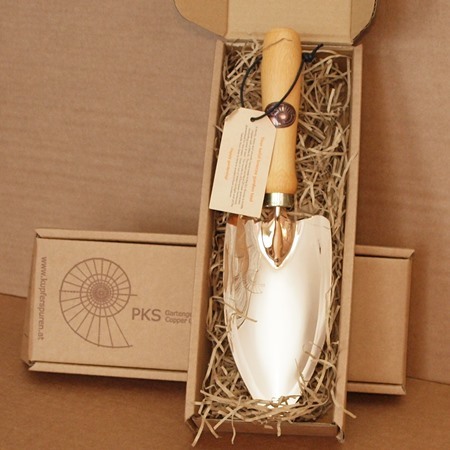 And here is the Castor Trowel in the small gift box with soft, shredded brown paper. As you probably know, the tools have a story to tell. Shortly after the launch of Implementations in 2001, we put together a booklet to tell that story. With each new addition we add a chapter or two. The booklet is now in its fourth edition, and the chapter added this time tells how, with no qualifications for the job, we found ourselves introducing them into the UK. "But most important are the users themselves: you. From the launch of Implementations in 2001 our customers have been our ambassadors, and for that we thank you."